Are retirement accounts considered marital property in a divorce? ?Are retirement accounts considered marital property in a divorce? ?How does community debt affect my divorce? ?What happens to the family business during divorce? Most people who get married plan for a financial future together. That often includes sharing many assets and saving for retirement. But not all partnerships last, and sometimes, despite your best efforts, the relationship ends in a divorce. When this happens, it can throw many of your future plans into disarray and cause a variety of problems when it comes to dividing up your shared assets. Asset division is often one of the most challenging parts of a divorce, and dealing with retirement plans is no exception to that rule. The state of Washington is a community property state. This means, most types of assets that you or your spouse acquire after marriage become shared, giving you both equal ownership interest in case of divorce. There are certain exceptions such as inheritances given solely to one partner or anything that you or your partner owned individually prior to marriage. However, if you “commingle” your assets with your spouse’s such that they are indistinguishable from community property, those assets will be considered community property. Even if only one spouse contributed to the fund during the marriage, it’s still considered community property during the divorce. Both partners are eligible for a fair share of all retirement accounts, so you should expect this to be a point of negotiation during your divorce. Do not try to move or withdraw retirement assets during the divorce until asset negotiation is complete. Not only could you face heavy tax consequences for early withdrawal, it could be considered an attempt to hide assets from your spouse, which is illegal and can cost you heavily. In many divorces, retirement accounts are the biggest assets that must be divided, so it’s usually in your best interest to be careful about negotiating for your share. In some cases, such as when splitting an account is impossible or would incur tax penalties, one spouse may choose to keep the account in exchange for an equivalent value in other assets. For the spouse who wants to keep a retirement account, he may also agree to take on a portion of a debt of equivalent value. In some cases, a Qualified Domestic Relations Order, or QDRO, may be necessary to split a retirement account such as a 401(k) without incurring tax penalties. With a QDRO, you may choose to let funds stay in your spouse’s account until you retire, or you may roll them over to an IRA. You may also choose to take a cash distribution, but you will face early withdrawal penalties if you’re under age fifty-nine and a half. You may also choose to take a partial cash distribution and roll the remainder over into an IRA, in which case you would only face the early withdrawal penalty on the cash. 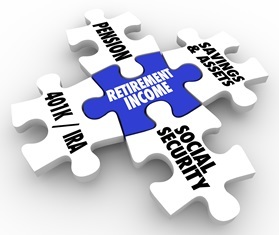 The rules about retirement accounts and how assets should be divided can be complicated. Consult with an experienced family law attorney to make sure your rights are protected and you’re not leaving assets on the table that are rightfully yours. The attorneys at the Law Offices of Molly B. Kenny have decades of experience with divorce and other family law issues, including complex asset issues and high-value divorce situations. To arrange a private consultation with an attorney at our Bellevue location, call us, or use our online contact form to send an email.